Natalie & Stephen know how to have a GREAT time! Their wedding day was so perfectly fun and non-traditional. 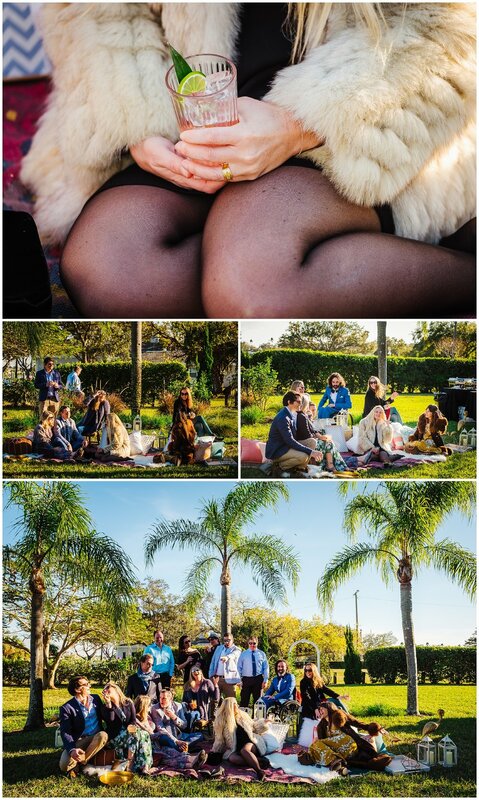 The vision for the day was an old Florida garden party meets the Golden Girls on spring break. They nailed it. The day was full of glorious sunshine with a bit of a chill in the air. Perfect for grilling, drinking, and dancing. We began the day at the beautiful historic boutique hotel Le Meridien in downtown Tampa. I loved that they got ready together! 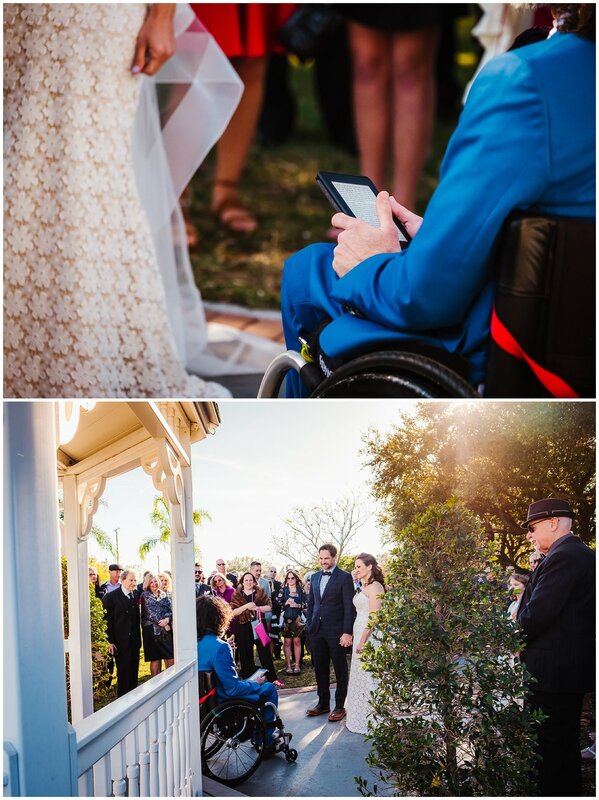 Natalie wore one of Stephen’s Navy shirts before he helped her into her STUNNING dress! Look at it! It’s amazing, and then you add that train and your head explodes. But THEN you add her bedazzled platform Alexander McQueen sneakers and you just retire. So. Much. Style. Let’s not leave out Stephen either! He looked amazing in his blue suit with the flowery shirt and knitted bow tie. His already piercing blue eyes glittered even more. Then he finished the lot off with rad high top wingtips. Done. It was so lovely and calm to have them get ready together and then we were able to take our time shooting around the amazing hotel. Having multiple opportunities and locations for portraits is always a dream. Before we knew it it was time to head over to Davis Island! We were all blown away by the set up when we arrived! String lights, cacti in hot pink pots, velvet couches, flamingos, and the coolest new vendor around the Cocktail Movement trailer. It was exactly what they wanted. A beautiful outdoor space with food stations everywhere, comfortable and cute places to hang out, and delicious drinks flowing. 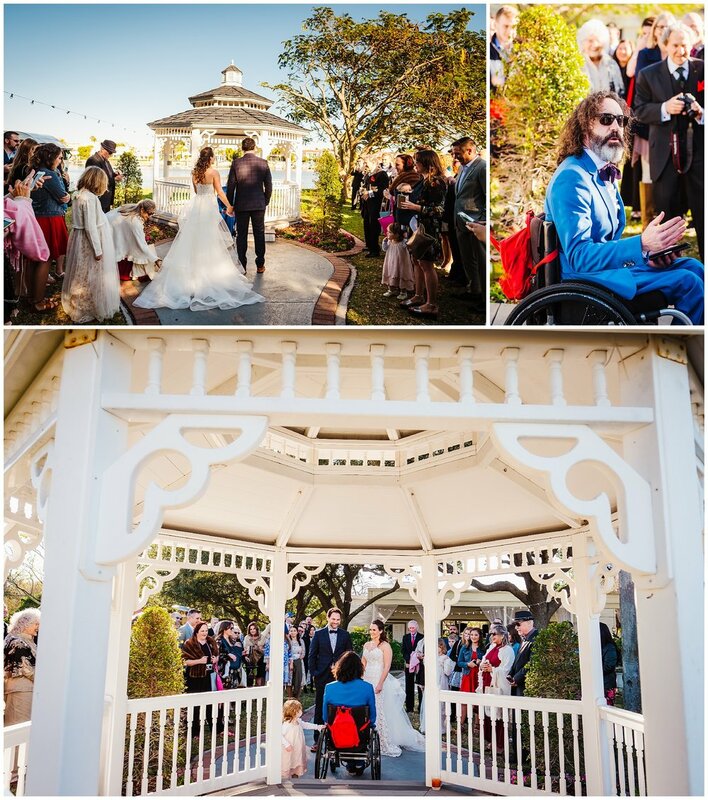 The guests were invited to take a polaroid and then grab a drink from the bar before gathering around the gazebo for the ceremony. Oh boy, the ceremony. It was amazing. Natalie’s brother in law delivered the most creative and wonderful ceremony I have ever heard. He began with beautifully describing his love for this perfect match and then went on to tell of their courtship. It involved a steel mill, exotic dancing, and taboos about dating your boss. It was as hysterical as it was truly heart warming. 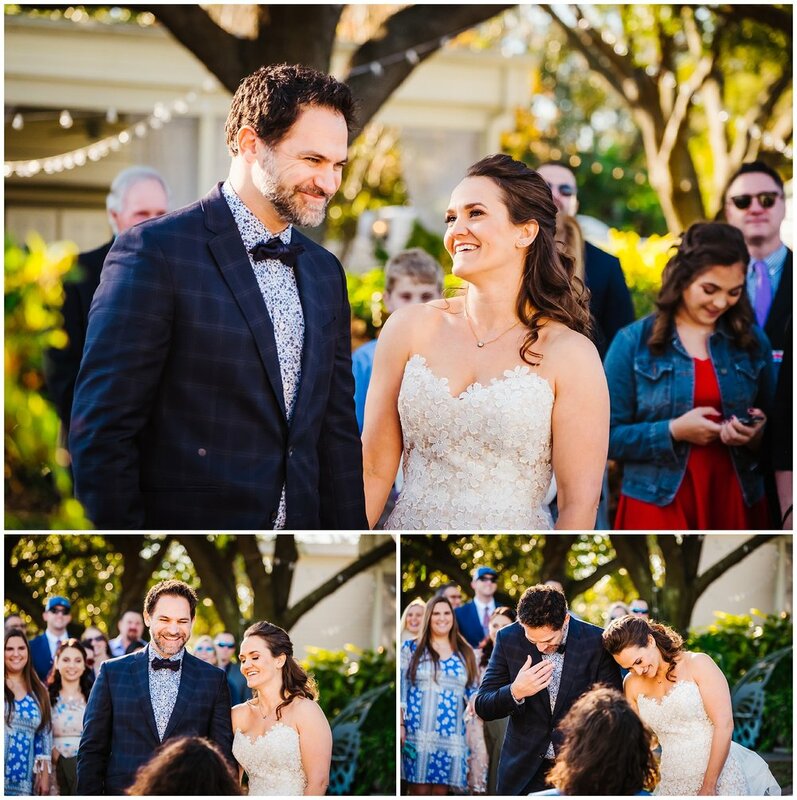 The looks of confusion, entertainment, and of total bliss swept over their friends and family. I fell somewhere in between. I knew how they had met and was thinking that this was an elaborate story to not give it away. Hint I met Joe the same way! It was only right after the ceremony that I realized it was the entire plot of FLASHDANCE! Natalie’s favorite movie. It was so perfect! Don’t worry though, they also included lovely vows and Stephen took a moment to express just how happy he was to call Natalie his wife. It was perfect! After the kiss it was party time! Everyone mingled and hugged as the food stations opened up. 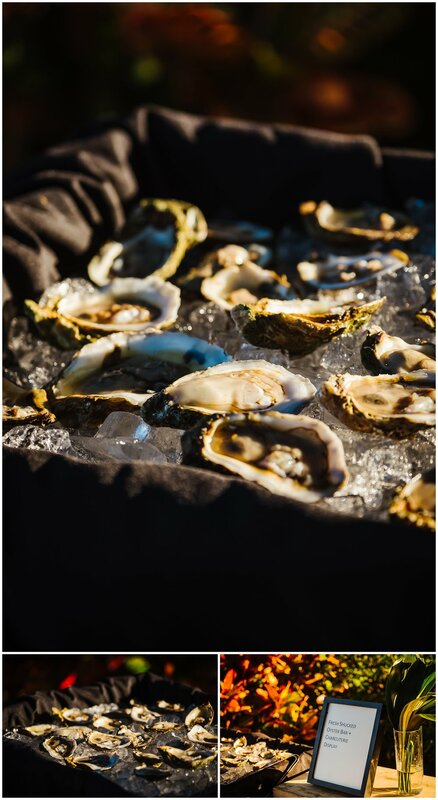 Oysters, charcuterie, duck fat fries, tacos, and more! Everyone was free to take it all in and the insanely good smell of grilling burgers hung over the entire garden. It was amazing! We took a few minutes for some family formals and then once the sun sank a little lower we had some more fun with romantic portraits. Their DJ was awesome! He built up the music from the perfect dinner soundtrack to the best mix of 90’s hip hop that made you want to MOVE! 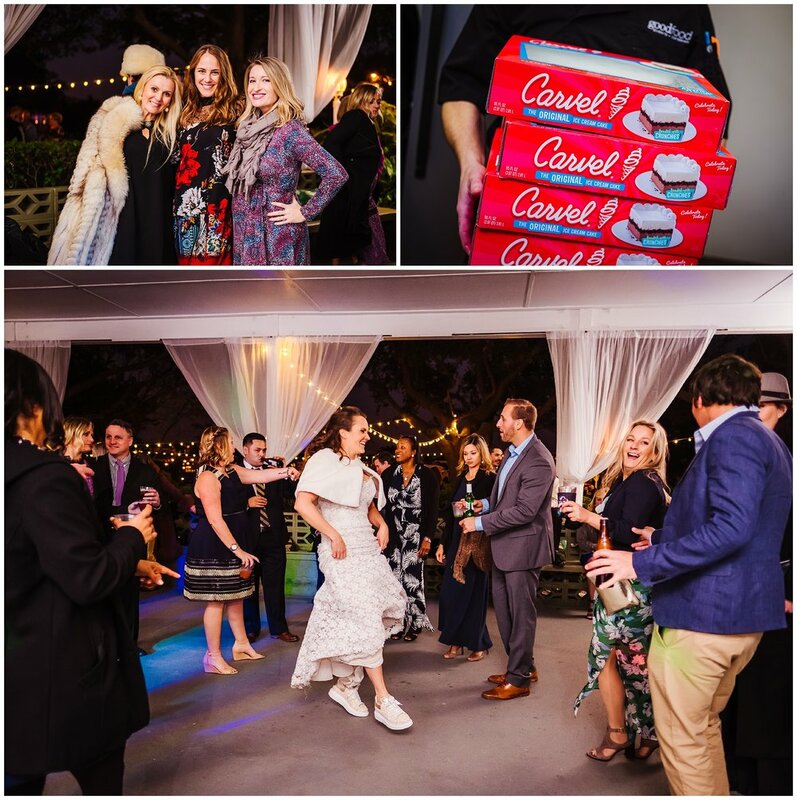 Later in the night they passed Carvel ice cream cake for dessert! I mean, YES PLEASE! Congratulations to these free spirits! It was such a fun expression of their love and excitement for each other. Love you guys!